Springtime ushers in an overwhelming feeling to revamp, clean up, and refresh your home and habits. 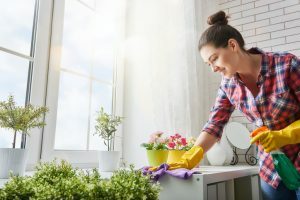 Beyond the basic vacuuming and dusting, here are some lesser-known tips to revitalize your living space and daily regimen. You should be removing the fuzz from your dryer filter after every load, but if you haven’t done it in a while here’s your reminder. The National Fire Protection Association reports that over 10,000 home fires start in the laundry room annually. Simply pull off the debris and fluff or use the crevice tool on your vacuum cleaner. When is the last time a visit to your dentist was part of your spring cleaning to do list? Now is the perfect time to call Sherman Oaks Dental, a Naperville family dentistry practice. Ideally, dental cleanings should happen every six months. This appointments give your dentist the chance to preempt possible problems like gum disease or loose teeth. During your visit, the hygienists will clean, floss, and polish your teeth in addition to removing plaque. Plaque is a sticky substance that forms on teeth. If left to itself, it’s the perfect breeding ground for bacteria and can develop into larger dental health issues like gingivitis. A biannual dental check up may also include X-rays to determine if there are any unseen issues. Our family dentistry practice understands that dental health is closely connected to overall health and that regular dental cleanings are a vital part of those efforts. As the weather warms and the days become longer with the start of spring, get outside! Hop off the stationary bike and take a jog around the local park or your neighborhood. The fresh air will do you good. Studies show that changing your fitness regimen will stop you from plateauing. Plus, it helps keep things interesting. Pillowcases and sheets should be regularly washed, but what about the pillows and comforter? These items only need to be washed about three times a year, which makes spring cleaning the perfect reminder. Strip the bed down and toss it all in the washer, but be sure to check the manufacturer’s label for cleaning instructions. Look in your closet and ask yourself, “what haven’t I worn in the last three years?” You may be surprised by how much you don’t need or use. The solution? Toss it out, donate it to charity, or if it’s a unique piece or in excellent condition, sell it online. While you’re at it, clean out your junk drawer, spam folder, and recycle that stack of mail you keep meaning to throw away. Spring cleaning extends far beyond sweeping and cleaning the bathroom. As part of your spring cleaning this season, remember to schedule an appointment for a dental cleaning with Sherman Oaks, practice to one of the best dentists in Naperville.